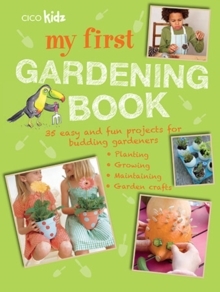 35 fun projects that teach children aged 7 and up how to garden. If you're a budding gardener, you can discover how to sow and grow successfully with My First Gardening Book. In Chapter 1, Getting Started, you will learn all the basics, such as how to prepare soil, sow seeds, choose plants and maintain your garden. In Chapter 2, Grow Your Own, put your skills to good use with projects such as the Tasty Herb Pot, Sunflower Alley and Eggshell Gardens. Chapter 3, Garden Decorations, shows you innovative ways to brighten up your garden, including Painted Pots and Ice Mobiles, and in Chapter 4, Garden Crafts you can combine gardening and craft activities, with fun creations such as Lavender Bags and Pretty Seed Packets. All the projects are explained in child-friendly language so that you can garden independently. You will soon enjoy all the rewards of your work as you watch your plants and flowers grow and blossom.